Midwest Home and the American Society of Interior Designers Minnesota teamed up this year to co-sponsor a “Life in Color” competition. We asked designers to send us their most vibrant work. From among the best and brightest, we chose these six winners. This Viennese Secession-style gem on Lake Harriet had gorgeous plaster and architectural detail when Tim and Sarah Spence purchased it a few years ago. But all was lost in a sea of white until they brought in Andrea Dixon and Jen Ziemer. The design duo used bold colors and patterns in the wall coverings, fabrics, and original artwork to infuse the house with the young homeowners’ personalities. Inspired by the lake and vibrancy of the natural landscape, the designers gave this unique home the verve it deserves. Heidi Kraus Kaplan and Michael Kaplan asked LiLu to give their traditional 1920s home a spirited feeling, and to incorporate existing furniture and artwork in new ways within the original floor plan. Lisa Peck and Christina Rymer used unexpected patterns, colors, and textures to create a sense of playfulness and whimsy. The eclectic mix of traditional and contemporary pieces reflects the family’s youth and lightheartedness as well as the home’s traditional architecture. The delightful design approach is apparent in the dining room but perhaps best embodied in a hand-me-down grandfather clock updated with purple paint. 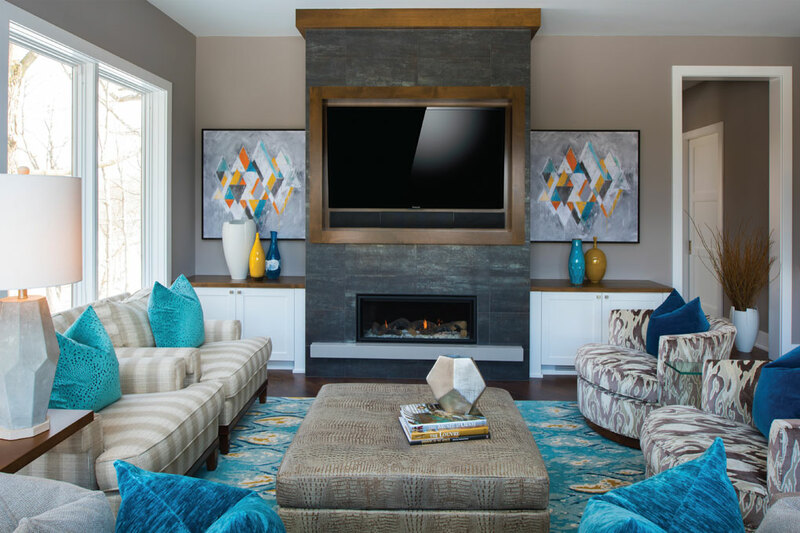 This lakeside contemporary is all about blue: Since the homeowners love the color, Kristen McCormick integrated rich shades of blue from teal to aqua to cobalt into the design. Though cool hues make a big statement, the designer warmed up the spaces with golds, beiges, patterns, and textures. As the jury noted, she used as much blue as possible, balanced it with neutrals, and then pulled it all together in the rug. The resulting design is fresh and lively, yet grounding and tranquil. This home celebrated color throughout, so when it came to their two ’tween girls’ bedrooms, the homeowners pulled no punches. Neither did designer Tani Nielsen. She covered the bedroom walls with saturated hues of each daughter’s favorite color—grass green and turquoise—and used restraint elsewhere to keep the rooms cool rather than juvenile. 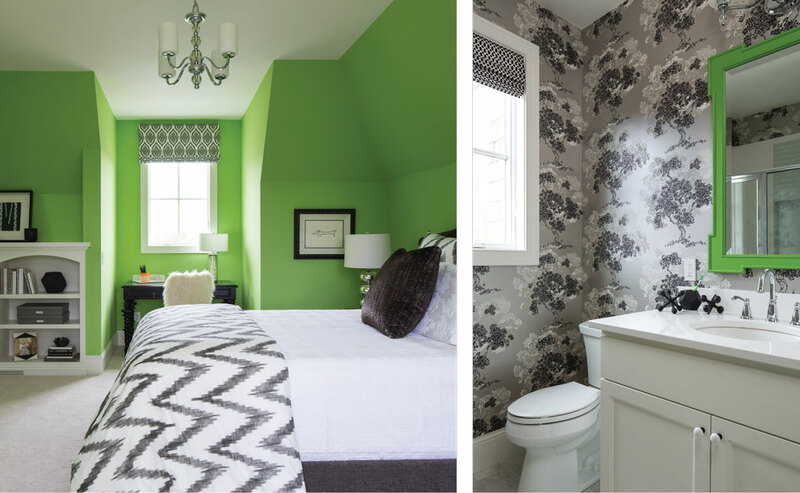 In the green room, patterned neutrals add a sophisticated touch. And Nielsen’s use of paint as the primary source of color means change is relatively easy, should either daughter grow into a new preference. This kitchen was a tired, heavy oak, “postage stamp,” says designer Keri Olson. The owners wanted a space transformed with lots of natural light and bright colors. 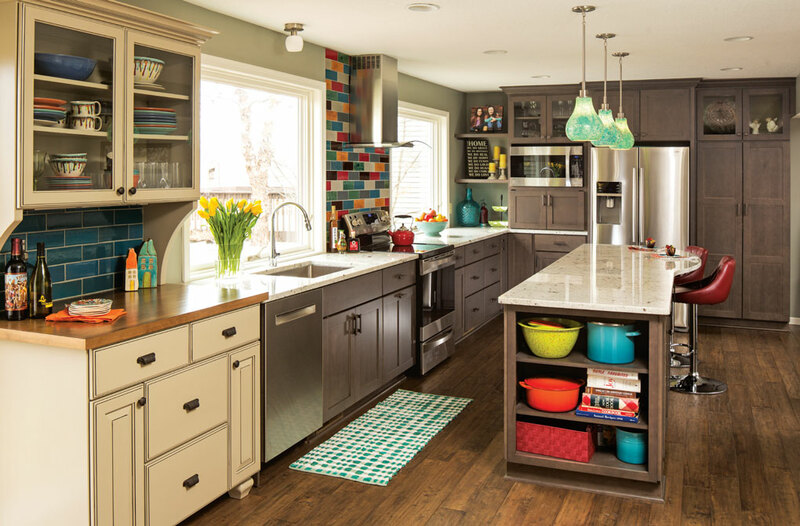 Olson added splashes of color with the custom tile backsplash, Le Creuset cookware, and fanciful pendants. She even showcased the owners’ colorful dishes in glass-front cabinets. She made this kitchen into a bright, happy place for cooking, baking, and the life of a busy family. The jury’s verdict on this kitchen: The designer did a tremendous job bringing many elements and colors together in a fun, eclectic room. 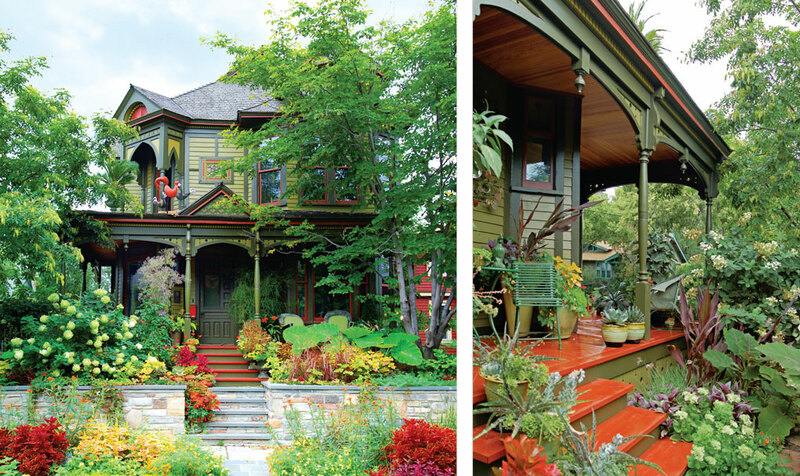 Designer David Heide made certain the exterior palette of Scott Endres’s Victorian house and newly remodeled porch followed historical precedent; Endres, co-owner of Tangletown Gardens, made certain his landscape remained the star of the show. The muted, earthy tones of the house are shades of olive greens, historically derived from iron ore, and the red accent color was once produced by mixing clay into the paint. The darker color of the trim accents the striking architectural features, while the lighter green of the house contrasts with the shadows created by the dentil mouldings and cutouts in the arches.